How to Reduce Cat Behavioral Problems: New study – FIREPAW, Inc. Many U.S. veterinarians and animals welfare workers have been telling clients this for years, and now there is scientific evidence to support it: Delaying weaning can reduce aggression and other unwanted behaviors in cats. This new study extends the common weaning period in the U.S. from 8 weeks to a recommended 14 weeks. As reducing aggression and other unwanted behaviors in cats can have a significant impact on the number of cats surrendered to animal shelters and set free on the streets, we hope that animal welfare and animal health professionals will review the results of the current study and pass the word on to their colleagues to do the same. Early weaning increases aggression and unwanted stereotypic behavior in cats, shows a new study… Based on the study conducted at the University of Helsinki, the recommended weaning age of 12 weeks should be raised by at least two weeks to 14 weeks. 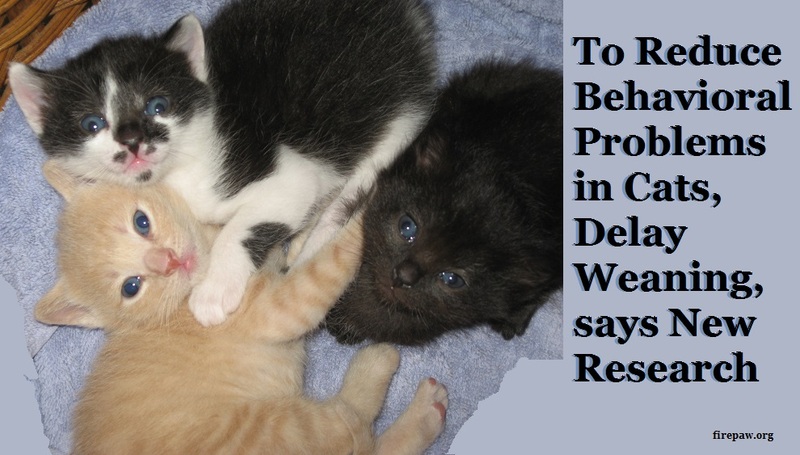 * Delaying weaning is an easy and cost-efficient way of improving the quality of life of cats. In Finland, the recommended minimum age of weaning is 12 weeks, but in many other countries, such as the United States, weaning of kittens as young as 8 weeks is common. *The common weaning period in the U.S. is 8 weeks so that would mean extending weaning another 6 weeks from the current norm to the new recommended period of 14 weeks. The study used the results from the health and behavior survey Professor Lohi’s group had previously conducted on nearly 6,000 cats, currently the most extensive cat behavior database in the world. According to the survey, many behavioral problems are more common than expected. More than 80% of cats were reported as exhibiting mild behavioral problems, while serious behavioral problems were reported for 25% of all cats. Feline behavioral problems can include shyness, stereotypical wool sucking, excessive grooming and aggression. Studies on other animal species have produced similar results. For example, among rodents, monkeys and minks, early separation from the mother leads to a higher prevalence of stereotypic behavior and aggression. A similar phenomenon has been found in humans.